Jordan Ewing's bridal collection, TIMELESS, is a tribute to her grandparents' era, a time of glamour and elegance. This collection accentuates the romantic, ethereal feeling of a more classically glamorous period, while adding a more modern, polished flair. These bridal gowns embody a timeless, romanticized aesthetic, with an emphasis on classical silhouettes, fine laces and intricate beading. "We are excited to see what Jordan will bring to the Atlanta community…Congratulations!" We are super excited to also be featured in British Vogue for our Timeless Collection shown at Vancouver Fashion Week! 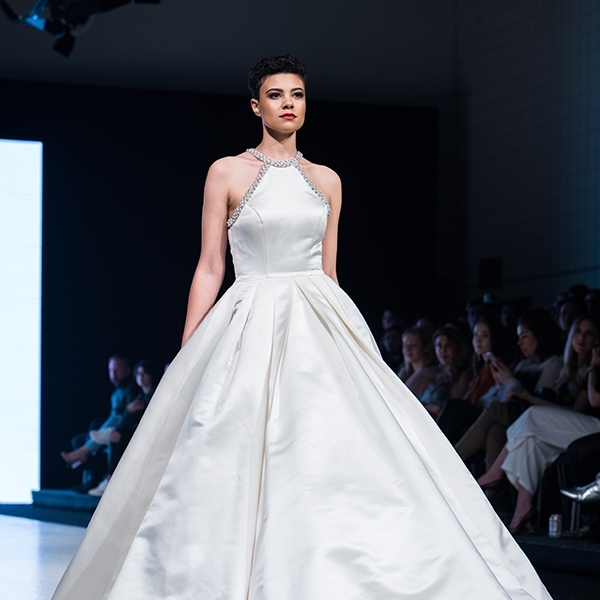 "American designer Jordan Ewing presented ZURI bridal with a fantastic wedding dress series. The classic and elegant silhouette of the classical style is a tribute to the grandparents' era. Exquisite straps and intricate beading add to the advanced fabrics of chiffon, satin, crepe and organza". “Creating and drawing came naturally to me from a young age,” she explained. “I started recreating the glamour and grace of bridal designs, marrying old Hollywood styles with modern flair.” At age 24, Ewing already owns and operates her own boutique – Zuri Bridal in Atlanta, Georgia. Day 4 of Vancouver Fashion Week 2018 marked an evening of variety with a strong selection of designers from around the world, and a special four-legged friend opening a show at the David Lam Hall in downtown Vancouver. "With Zuri Bridal, Ewing aims to provide clients with an unforgettable experience that satisfies their nuptial needs." Find inspiration in old Hollywood glamour with simple silhouettes and dramatic details. A tribute to her grandparents' era, the style accentuates the classically glamorous period with polished elegant silhouettes. Fine laces and intricate beading complimented beautiful chiffon, silk satins, crepe, and organza. A highlight was an exquisite beaded floral lace gown with sweetheart neckline and exposed back.